Ada berita duka bagi kalian pecinta Anime Fairy Tail. ada kabar yg menyebutkan bahwa Anime Fairy Tail akan berakhir pada tanggal 30 Maret nanti. Dulu Bleach, sekarang Fairy Tail. Manga creator Hiro Mashima : "Please be patient … for me to announce some good news"
ANN confirmed that Kodansha 's TV Magazine announced on Friday that the Fairy Tail anime's television broadcast run will end on March 30. The adaptation of Hiro Mashima 's Fairy Tail fantasy adventure manga premiered on Japan's TV Tokyo station in October 2009. 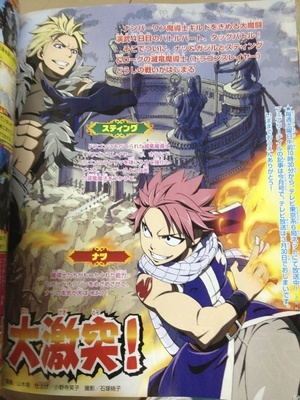 The April issue of Shueisha 's Jump Square magazine is revealing on Monday that the Driland anime will begin a new run in Fairy Tail 's current Saturday 10:30 a.m. timeslot on April 6. Until the time comes, I cannot say something I've always wanted to say, even on Twitter. Please be patient and wait until the time comes for me to announce some good news. Crunchyroll has been streaming the Fairy Tail series as it airs in Japan. Funimation released the anime's fourth part on DVD and Blu-ray Disc in North America in February 2012. Del Rey published 12 volumes of the original manga in North America, and Kodansha resumed publishing the manga with the 13th volume in 2011. The 38th volume of the manga will include an original anime DVD in a special-edition bundle in Japan on June 17. The original manga's story began with a teenaged girl named Lucy Heartfilia who aims to join the world's most notorious mage guild, Fairy Tail. During a daring rescue, Lucy encounters Natsu "Salamander" Dragneel, a quirky Fairy Tail member and a teenaged practitioner of the ancient Dragon Slayer magic. Lucy is eventually welcomed into the Fairy Tail guild as she, Natsu, and other members go on various quests together. Update: Twitter post from Mashima added. Update 2: Mashima has updated his Twitter with more information. untung saya bukan pencinta anime mas, jadi ga sedih hehe...makasih infonya mas..